Epigastric pain radiating to the chest for 18 hours. ECG makes the Dx. Troponin makes the Dx. CT makes the Dx! This ECG is from a middle aged man who presented with 18 hours of epigastric pain radiating to the chest. This ECG shows ST elevation in aVL with reciprocal ST depression in inferior leads and V3-4, consistent with high lateral MI and posterior involvement. This ECG is from a healthy teenage male who presented with an irregular pulse. This ECG is from an elderly man who presented in VF cardiac arrest and had return of spontaneous circulation after 4 shocks. 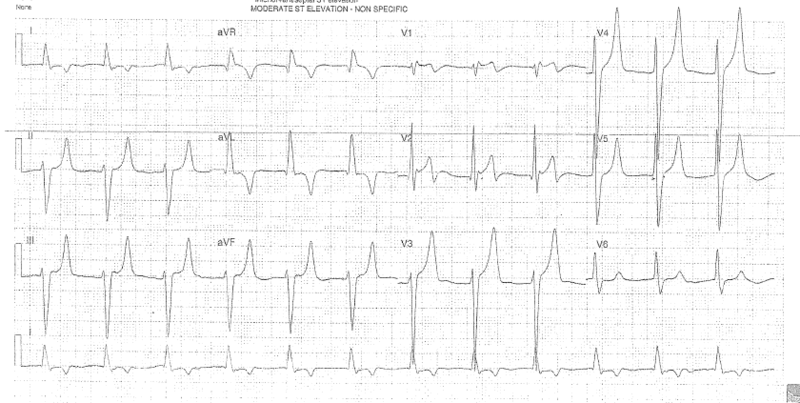 This ECG shows junctional bradycardia with diffuse ST depression and ST elevation in aVF. The cause was severe triple vessel disease. This ECG is from a patient of unknown age who presented with weakness, decreased urine output and vomiting. This ECG shows long QT due to a long ST segment without altering the T wave, caused by hypocalcemia. IVCD, Saddleback STE in III, with reciprocal STD in aVL: Is it pseudoOMI or OMI? Echo with Speckle Tracking gives the answer. This ECG is from a woman in her 70s who presented with acute chest pain and dyspnoea on a background of hypertension and congestive heart failure. 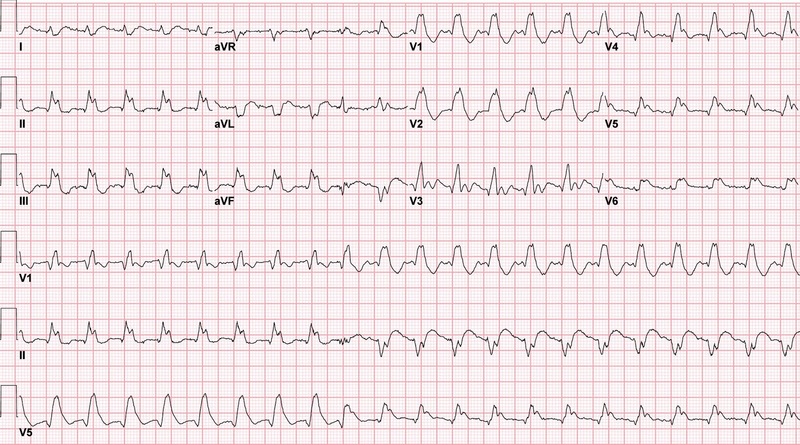 This ECG shows inferior ST elevation with an abnormally wide QRS (intraventricular conduction delay). The cause was an acute inferior MI. This ECG is from a patient of unknown age who had recurrent presentations for shortness of breath due to asthma. This ECG shows subtle ST elevation in III with reciprocal change in aVL. The cause was inferior MI. This ECG is from a middle aged male who presented with chest pain. He was pain free at the time of this initial ECG. This ECG shows subtle inferior ST elevation with reciprocal change in aVL. The cause was a large inferior infarct.